I have a wood mystery. NOTE: when I took the image I had not finished stripping off the old finish. It now looks much neater. Look at the gouges. They mystify me. If I were to toss out a guess I would say that my trim is mahogany with a faux finish. This finish was then varnished. After I removed the varnish I was left with the faux finish. However, this makes no sense as stripping off the varnish would have also stripped off any faux finish. But then what is that darker wood lurking under what sure looks like a painted, faux finish? I am stumped. My eyes tell me one thing while my brain argues with my eyes. I hate when my eyes and brain argue. 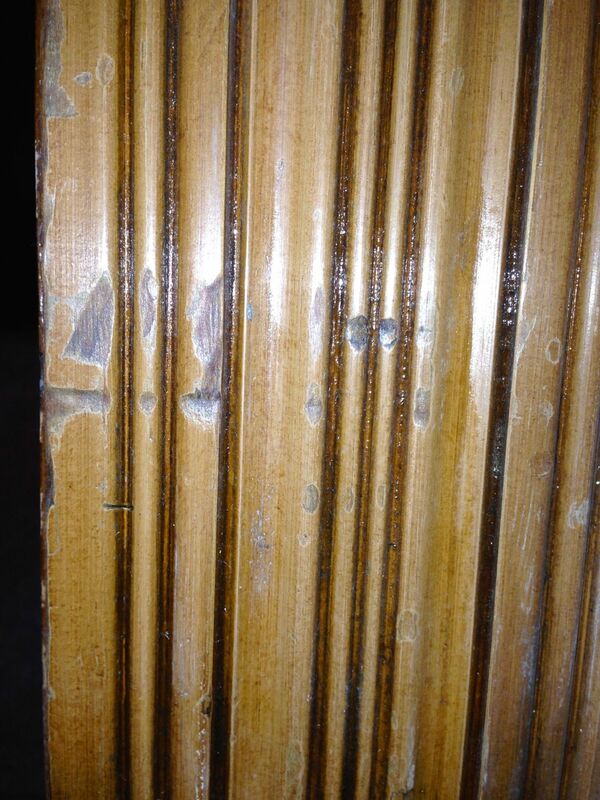 When we were on the task of stripping the 8 layers of paint in our home we came across this in the upstairs wood work. After basically trying to strip one window in the upstairs landing for basically days we decided to stop. The original paint was a almost like a baked on enamel that would not come off. We had to sand that one window because I wanted it to match the staircase that was a natural wood finish. We did not do anymore stripping on the upstairs level because of this. It was actually a relief since it took us about 3 years to strip and finish the entrance, staircase and back parlor with a fireplace, built in and wainscoting going half way up the wall. With areas up to 8 layers of paint. Oh and this is all Douglas Fir which is extremely soft wood. I am glad we did it but I don’t think I could ever do it again. This doesn’t include what we had to do with the floors….another story. This looks like my faux finish but the dings in mine are light colored. I have attempted to darken the dings with various scratch covers so they are not as obvious, since I do not want to remove the faux finish. I suspect that someone in the past has found an effective way to stain the dings in yours. And yes, the faux finish is very tough. At some point I plan to retain a faux artist to come to the house and touch-up a lot of damaged trim and doors.